Mark your calendars! The BVAA will be doing a Plein Air event with Gerard Blouin in Sutton on Saturday, May 21, 2016 from 9:30-3pm. Gerard is a talented artist who works in oils and watercolors. The location is the Shaw Farm property in Sutton. Restricted to the first 12 people to sign up and pay a $25 refundable space holding fee. Money will be refunded at the end of the attended workshop. 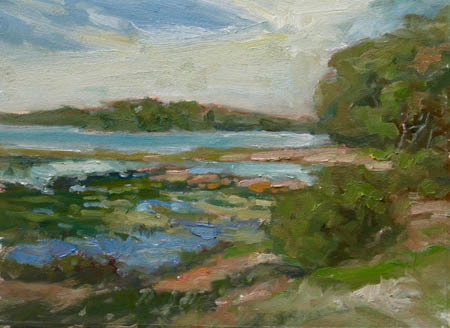 Paintings done at the Plein Air will then be showcased at the Second Annual Sutton Art Festival two weeks later. Bring food and drink with you. This is an abandoned property and there is nothing here. The nearest restrooms are just north of the intersection of Rte 146 and Central Turnpike, at the Market 32 grocery store. There is also a 5 Guys restaurant there and a gas station. While technically the address is on “Shaw Lane”, I wouldn’t rely on a GPS to get you there – several members have had issues with their GPS finding the road. It’s best to know how to get there manually. You take Route 146 toward Sutton and get off of Exit 7. Head west on Central Turnpike. About three miles down is the intersection with Putnam Hill Road. This is where the Blue Jay used to be before it burnt down :). Take a right (go north) on Putnam Hill Road. The driveway to Shaw Farm is your third road on the right. Please go up to the farm buildings, turn around, and then park on the right side of the driveway heading back toward the road. That way we keep our cars out of the line of sight.